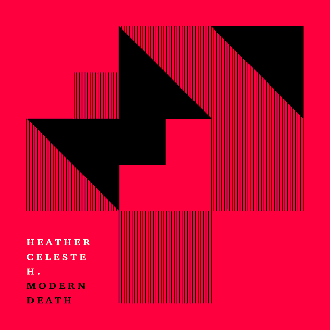 In August 2014, Heather Celeste fired her voice deep into compositions with a mix of drums and deformed and resampled analog sounds. She has undertaken a wild creative process, releasing masses of dark music monuments which perch over techno, coldwave, minimalism quarrel and dub digital. Modern Death consits of minimalist hallucinations, separated in space but strung tight with tension. From a complex rhythmic skeleton, Heather develops evolving textures and lyrics, filling out the narrative arcs. Listening, we dive into streams of consciousness, guided by her distant voice—between singspeak and ethereal singing—which rises over whirlwinds of arpeggiators, wisps of disturbing basses, disrupted by extreme percussions. Heather is fed by the futurology of Ray Kurzweil, New York video art of the 60s and 70s, passionate about design and architecture. She observes the modern world, cross-references Descartes, quantum physics, psychoanalysis, and formulates her hypotheses in the form of song.